See, this gum isn't your run-of-the-mill bubblicious. These chiclets are designed for elite athletes and they're packed with stimulants that will help you achieve optimal performance, without the added liquids sloshing around in your stomach. This gum was designed by a runner for a runner. Nick Symmonds, pro track athlete and 2-time Olympian, knew that runners are always on the hunt for quick energy, so he developed a simple, low calorie solution with rapid absorption and a powerful punch. In fact, at first chew, I was a bit taken aback by the fight these little guys have inside of them. I chomped down on two pieces at once (per my usual gum addict behavior) and the intense energy burst pulsed through my veins for a solid 4 hours. So for round dos, I limited myself to only 1 minty chew, which resulted in the perfect amount of energy I needed to kick my lazy legs into action. So now I pop a single piece before intense workouts like leg days and track workouts, or simply when that 3 o'clock slump hits me a little too hard at work. It gives me the kick I need to get myself in gear, without feeling like I electrocuted myself with some super synthetic pre-workout. 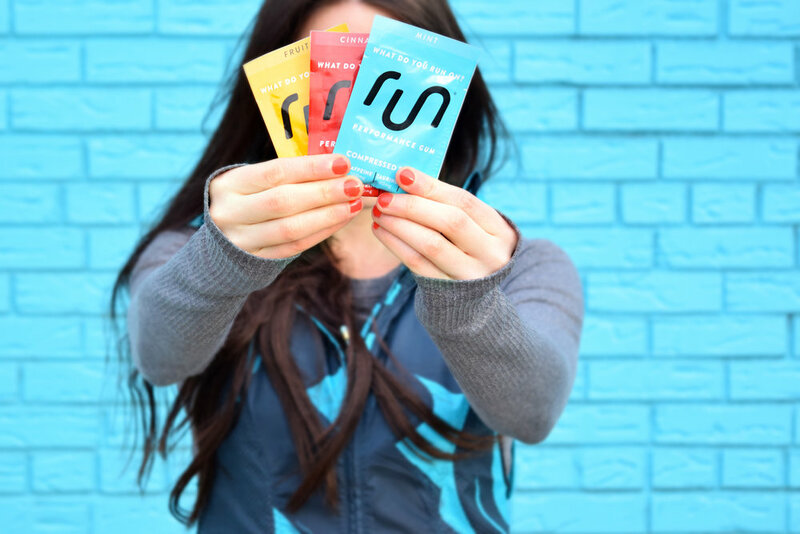 I've teamed up with Run Gum to give a rockin' sample pack to TWO of my #fitfriends! To enter, simply scoot on over to my Instagram post for full entry details. Unfortunately only US residents can enter and I will randomly be selecting the winner on Tuesday, February 28 at 12pm EST. Good luck y'all!